OTTAWA, CANADA - Eurocom Corporation has launched a mobile version of its super powerful notebook, the EUROCOM 5600 Monte Carlo, featuring the Intel® Pentium® 4 Mobile processor at 1.6, 1.7 and 1.8 GHz. Sleek and beautiful, the new EUROCOM 5600N super-notebook with a whole new 400 MHz system bus architecture is a perfect computer solution for professional users. It supports Intel® Pentium® 4 Mobile processor at 1.6 and 1.7 GHz, powerful new graphics capabilities, more RAM, up to 40 GB hard drive space, secondary battery, two optical drive bays and even a DJ CD Player function. Powerful ATI Mobility Radeon 7500 graphics with 64 MB DDR video SDRAM brings pictures to life on the very high contrast 15-inch SuperXGA+ or UXGA LCD screen with up to 1600 x 1280 resolution. Up to 1 GB of 200-pin 266 MHz DDR SODIMM DDR SDRAM coupled with the powerful graphics dramatically raises the bar for the system 3D performance. A second battery can be inserted in the Bay Two to increase the battery run time. 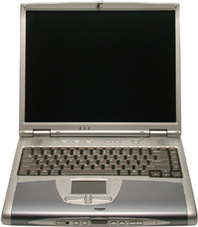 The EUROCOM 5600N powered by the Mobile Pentium 4 processor offers extended battery use as well as lower power usage. Two smart bays (one fixed/one versatile) that support two optical drives (choice of: CD-ROM, DVD, CD-RW or DVD/CD-RW Combo), allow for data backups and creation of extra copies of audio/photo CDs directly between source CD and a blank media bypassing the Hard Drive. The front panel audio DJ CD Player Control with separate power switch allows playing favourite audio CDs or MP3's even when the notebook is shut off. Moreover, the notebook includes five built-in Easy Start Buttons and one button for instant retrieval of new email received. By simplifying common tasks, these extra buttons help users to save time and increase productivity. The keyboard is ergonomic to ensure user's comfort and efficient usage of the notebook even over long periods of keyboarding sessions. Optical SPDIF output (5.1CH for DVD movies) combined with the TV-OUT port output at 1024 x 768 resolution allows users not only to watch DVD movies on the road, but to hook the notebook right into their Home Theater system. The EUROCOM 5600N comes with four USBports, IEEE 1394 FireWire, 10/100 Fast Ethernet, 56K V90/V92 Modem on-board and wireless LAN. Outstanding performance, high graphics capabilities and overall functionality coupled with over two hours of battery life with the primary battery, a secondary battery and beautiful design, make this model the most desirable notebook. Eurocom has been shipping the 5600 model series for over 3 months.